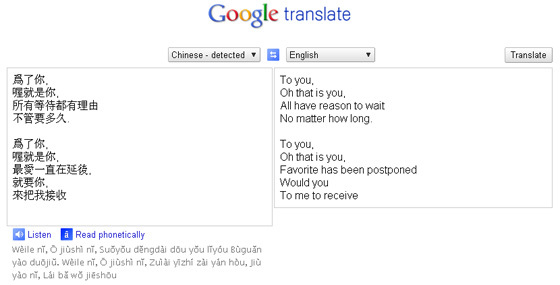 New Google Translate Features | personal.amy-wong.com - A Blog by Amy Wong. I just tried it with SKE48's Glory Days, and got to admit the translation was pretty good but unfortunately it didn't give me the option to listen. I still will be using this to read Ameba Blogs. I was using Kanji and I have never seen it either. I am going to have to use it on Sato Amina's blog who' s Japanese is not standard and rather unique. Her use of Kanji and words only a 20 year old would gives non-Japanese translatqrs fits. I used it with Yu Aoi's old blog message, and seemed pretty accurate. Yes it was fairly new when you posted in 2011. The first version of Listen with all those languages was in May 2010 and used the eSpeak voice (a community project), then they upgraded some of the languages to commercial voices in December 2010. And I worry about language beginners because they sometimes fail to realise that automatic translation CAN make mistakes. A version that has been proof-read by someone who knows both languages well is always better. Nothing beats bilingual translation, of course. I’d like to see what the future developments of AI will bring, though.